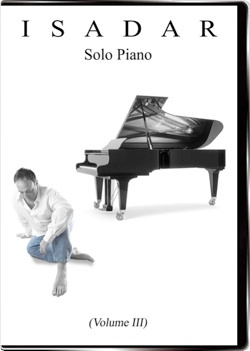 Isadar: Solo Piano, Volume 2 is the second installment in a series of four (so far) DVDs of Isadar’s live performance and music videos from his six (so far) solo piano recordings. Each DVD has an assortment of pieces from each album, except In Search For the Meaning of Christmas, which has its own DVD. The live performances are filmed from a variety of angles, making it easy and interesting to watch Isadar’s hands as he plays. There are also quite a few montages that show several different views at once. This is not only educational for those who want to play Isadar’s music themselves, but it also keeps the visuals exciting and dynamic. The two music videos on this DVD are from Isadar’s 2003 release, The Purple Heart, which is an incredible hour-long improvisation honoring those who lost their lives in the 9/11 tragedy. Isadar presents the album as a series of thirteen tracks that flow together on the album, but each has a beginning and end for purposes of making videos and allowing the tracks to be played one at a time. The first video is “New York City Skyline,” which features ever-moving film footage of the skyline at night. The second is “Ice,” with gorgeous footage of snow and ice in New York City (I assume) as well as of Isadar out walking in the bitter cold. I was familiar with all of the pieces on this DVD, except for “Letting Go,” which is from Isadar’s upcoming solo piano CD called Red. It’s a great piece, so this “sneak peek” into the new album shows great promise! I thoroughly enjoyed watching this video, and highly recommend it. 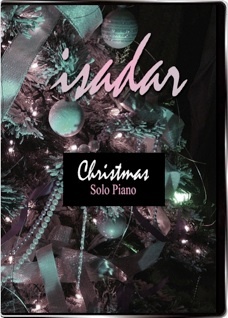 It is currently available only from isadar.com.